Passports with Purpose Raised How Much? Thank you to all who contributed to the Passports with Purpose fundraiser. We raised $26,000, which will help five farming communities in Honduras to farm more sustainably for the next five years. The tools and education provided to them through Sustainable Harvest International will make a major and long-lasting impact on these communities. They’ll plant thousands of trees and help feed hundreds of people in each community through this work. If you bid on prizes, you should be finding out if you won (you won’t be contacted unless you won) by December 22 at the latest. A big thanks to all the sponsors of PWP, including TBEX and HomeAway, and our Frisco Kids and Jersey Kids prize sponsors, Schoola and Breathometer. A reminder that you can still use Schoola’s 25% off discount code TRYSCHOOLA at checkout, through December 30. And for last minute gifts, Breathometer makes two portable products that connect to your smart phone, for checking your blood alcohol level. It’s fun to use and helpful too. Last minute! I have two family packs of tickets to give away to the red carpet scre ening of All Hail King Julien, Netflix’s newest original series. I need to pick two families tonight to give them to. If you’re interested, leave me a comment below with the number of people in your family, and let me know how to contact you. If you don’t want to leave your email address in the comment, you can email me at contest@friscokids.net, but please do put the comment down first. At the screening, you’ll see the first five episodes of All Hail King Julien. 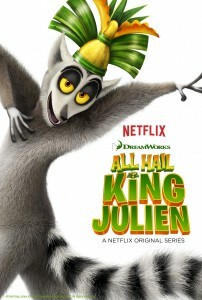 Madagascar’s King Julien scored his own series! King Julien will take on the jungle’s craziest adventures in the new comedy series, along with his loyal sidekicks Maurice and Mort plus a whole new cast of colorful animals. 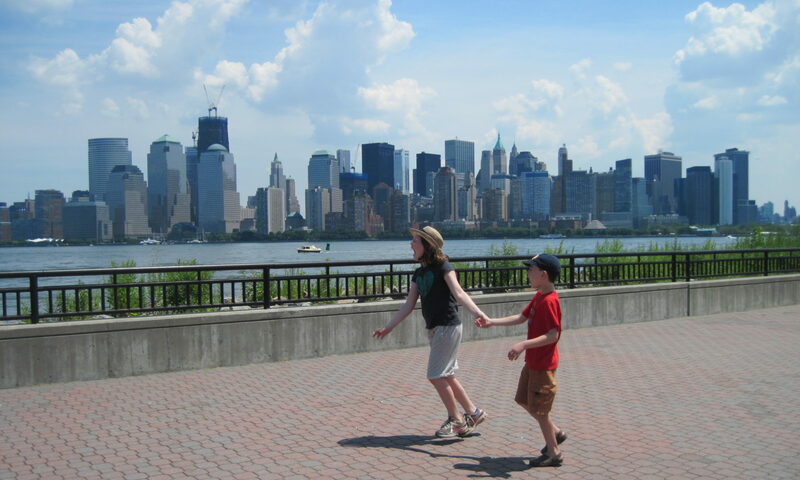 When: Friday, December 19 from 7-9 p.m.
For the last few years, Jersey Kids has participated in Passports with Purpose, a fundraiser organized by travel bloggers to use our connections to do something impactful in the world. 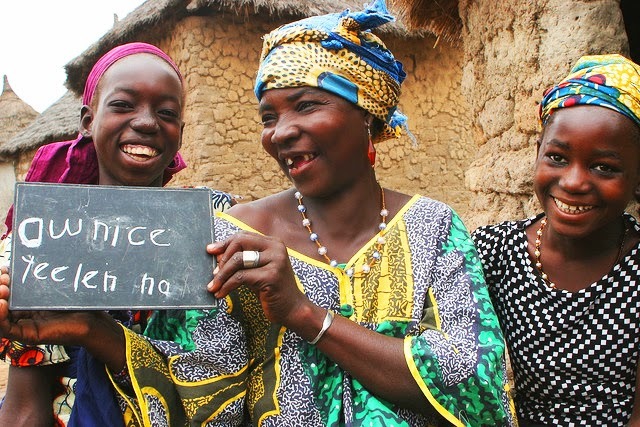 This year the project is to raise funds to build three schools for kids, and three adult literacy programs in Mali, Africa, through buildOn. For the third year, our sister site Frisco Kids is participating in Passports with Purpose, a fundraiser run by travel bloggers to give back to other communities. Each year the organization chooses on project and raises funds for it. In the past, the group built a school in Cambodia, built a village in India, and libraries in Zambia. It’s very much of a grass roots fundraising effort, and minimum contributions are $10. This year, the recipient organization is Water.org, which will build wells in two Haiti communities with the funds. The goal is to raise $100,000 this year, which is easily doable even in $10 increments! Clean water is so important and it’s something we take for granted here in the U.S. In fact, I just wrote about the importance of clean water for A Garden Life profiling another fabulous clean water charitable organization, Water for People. To encourage you to donate, bloggers solicit amazing prizes like hotel stays in Sonoma, Maui, Vancouver, Mexico, Helsinki, Nicaragua, Mumbai, a trip to Rome, a week in a Provence, an Amazon river cruise, white water rafting in the Colorado river, travel gear, digital cameras, Kindle keyboards, and gift certificates for all kinds of things. The fundraising ends on December 11th at midnight, with prize winners announced on December 18th. How to enter? You get one entry for every $10 donation. In the “# of entries” spot on the right, put in how many entries you want for each prize you’re interested in, and then give them your email address at the bottom. Easy! a Garmin Nuvi 1490LMT 5-inch bluetooth portable GPS with lifetime map and traffic updates. List price is $350. This Nuvi has an ultra-thin design and offers Bluetooth wireless technology for hands-free calling. 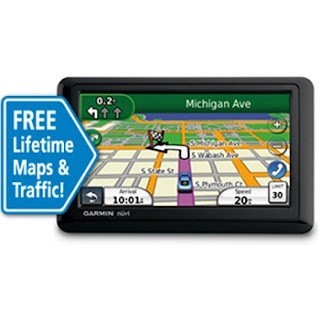 No need to pay for map and traffic upgrades – they’re free for life. The device even has an ecoRoute feature which will calculate the most fuel-efficient route. Shipping for U.S. winners only. Why am I excited about this prize? I have a Garmin Nuvi and use it ALL THE TIME in New Jersey. I would not make it down the street without my GPS. Mine is not this fancy, and I would love one with traffic updates and the Bluetooth calling technology. Plus, mine doesn’t have the ecoRoute feature, which I’d also love to have. So I’ll be bidding to win this, along with the other great prizes offered. How do you like to spend Halloween? 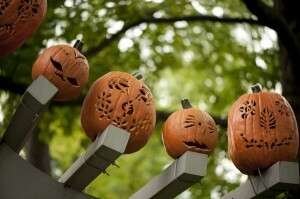 The New York Botanical Garden has a haunted pumpkin garden. You can win 4 tickets to go – info at the bottom. I carved this myself! Ha ha, just kidding. I haven’t been to the New York Botanical Garden (but the rest of my family went a few years ago when I was at a conference). They loved it. And this event looks like fun. Lots of carved pumpkin sculptures. It runs from October 6-31, and has tons of different kid-friendly activities. 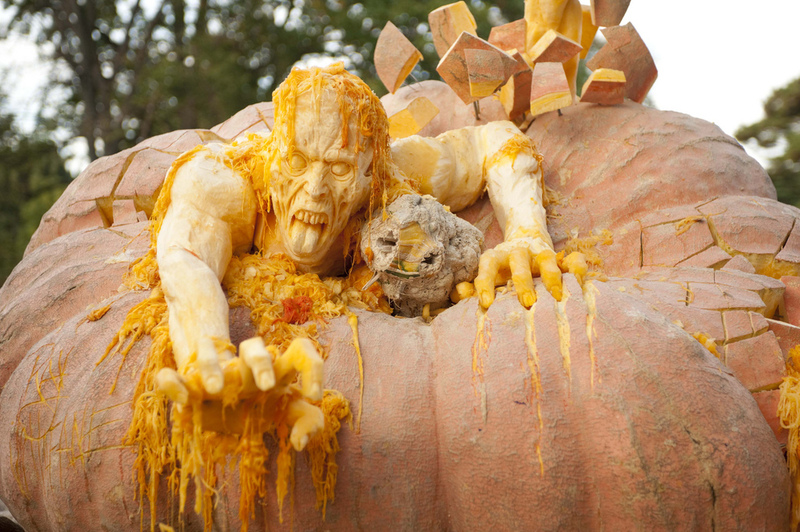 The Haunted Pumpkin Garden is located in the Everett Children’s Adventure Garden, open daily with guided activities from 1:30 to 5:30 p.m. on weekdays and 10 a.m. to 5:30 p.m. on weekends. That might include a parade, dissecting owl pellets, potting buckwheat seeds to take home or decorating science bags for fall collections. On other days there are pumpkin carving demonstrations, a pumpkin party, a pumpkin carving weekend, carving workshops, and spooky nighttime adventures. See the whole schedule here. Pumpkins greeting you at the entrance to the gardens. Tickets are $20-25/nonmember adults, $8-10/nonmember kids, and $15/members. Prices vary depending on the date (there’s no “one price” on the website – it’s a little confusing). 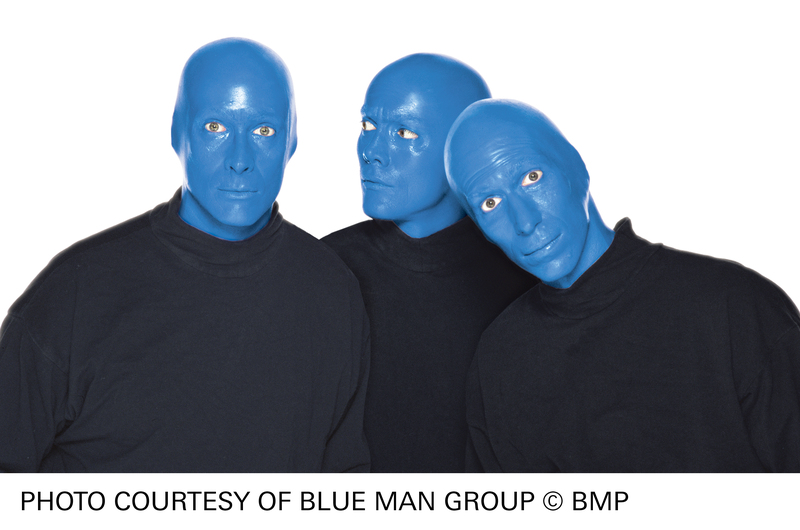 Want to win a 4-pack of tickets to use any day from October 6-31? You’ll have access to the rest of the gardens as well, including a narrated tram tour and other exhibitions. Post an entry below stating your favorite Halloween tradition. Also leave me your email address, so I can let you know if you won. If you don’t want to put your email address below, still leave an entry, but email me telling me which entry is yours, at blog (at) jerseykids (dot) net. Entries must be received by Saturday, September 29 at 6 p.m., and you must reply to my email within 24 hours or I’ll move on to the next person. Winner will be chosen using random.org.